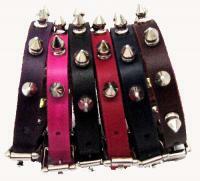 1/2 Wide Spiked Leather Collars 1/2 Wide Spiked Leather Collars  - $18.00 : Your Pet Store, Made in the USA! 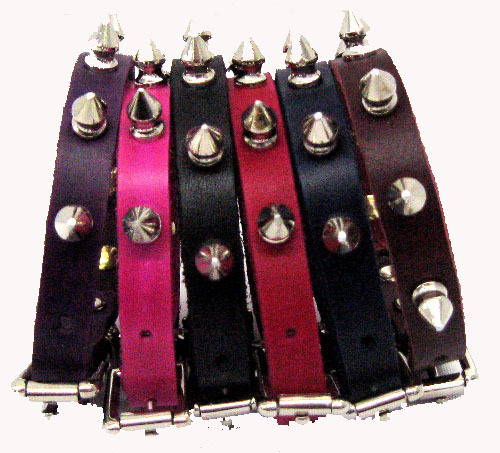 1/2" wide leather collars with 1/2" long spikes riveted on. The spikes are originally very sharp, however, we use a special grinding wheel to slightly round the tip of each spike for the safety of your pet and your furniture. Available in black, brown, blue, red, pink, or purple. All collars are hand-dyed and hand-crafted in the USA. We apply a water-resistant coating after the dying process to protect the leather from light water exposure.